From the shoreline, we captured this picture of the Labrador Ferry named the Apollo making transportation between Newfoundland and Labrador easy. 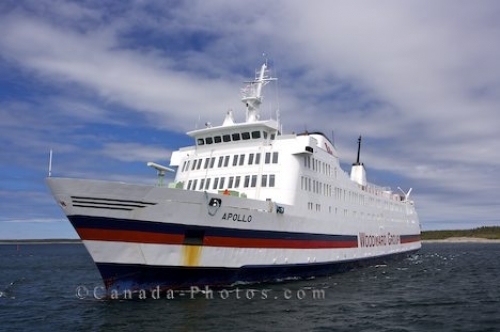 The name of this ferry is the "Apollo" and it can be seen making daily excursions between May and January back and forth between Newfoundland and Labrador since its maiden trip in 2000. During the busy tourist season, the ferry will make more than one trip as long as the passenger need is there. Picture of the Labrador ferry after making another crossing as it arrives at the terminal in St. Barbe, Newfoundland.